Outstanding calendar-map infographic from Infographer.ru, a Russian infographics site and design agency in Moscow (view in English). 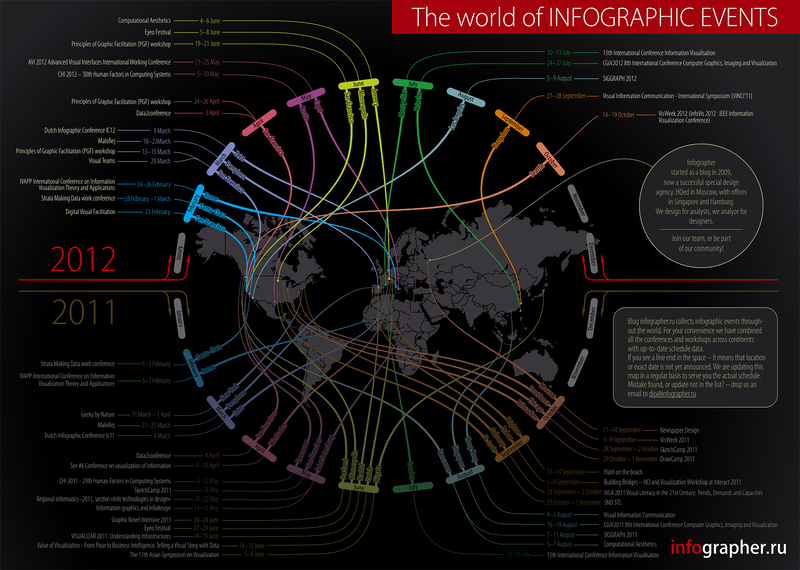 The Infographic Events Calendar 2011-2012 shows many (but not all) visualization, data and infographic conferences and events around the globe. They collected over 40 conferences and workshops dedicated to information visualization for last year and the upcoming schedule for 2012. The calendar-map color codes the events by month and obviously connects them to the correct location on the world map. I like the text of the city name included in the connecting lines, and the months with no events are gray so they don’t add to the visual noise of the bright colors. Somewhere on the design they should have included the URL for people to find their original posting. When this get shared online, readers will have a hard time finding the original site. Infographer also posted some behind-the-scenes information about the development of the design. Check out their early drafts in the complete blog post. Thanks to Irina for sending in the link and posting the English translation of the development process!